Remember when you were a kid riding in the back of your family station wagon, facing the wrong way and making faces at the cars behind you? Well, engineers at Tesla Motors do and they've thrown in an optional third row of rear-facing kiddie seats in the Model S.
Yes, the world's most talked-about electric car will have third row kiddie seats in a throwback to the 1970s. Check out the photo if you don't believe it. Look comfy? So far, Tesla engineers have been silent on these issues. The good news is that the rear glass on the Model S has full UV protection, so your kids won't be getting skin cancer from riding back there exposed to the sunlight. Something their little video game exposed, fluorescent-tanned hides will appreciate. 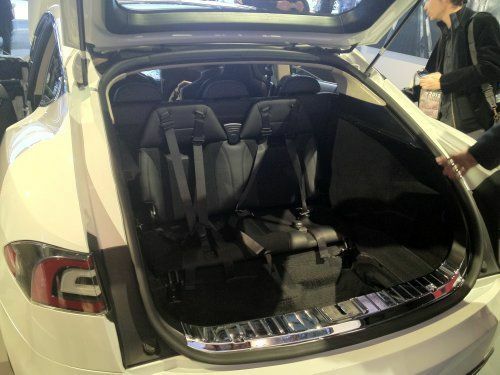 Interestingly, these third row kiddie seats were mentioned over a year ago – just before the 2011 North American International Auto Show (NAIAS) when Tesla was taking the Model S in to show off it's “alpha stage” of development (definite computer geeks over there at Tesla). Since then, they seem to have vanished from the vehicle's descriptions in various media and only now resurface, a few months before the car goes into production. Now they're an option in the “beta production” being displayed. They're also listed as an option on the Model S pre-order list for only $1,500. Looking at the seats being offered, it's hard to see how they rate that kind of price tag. The $15 camp chairs at Walmart look more comfortable and they're 100 times cheaper. Of course, the Model S is being billed as a mid-priced luxury sedan and as such nothing can be an “option” for under $1,000 and since there are two seats, it's obvious that they must cost more. Another interesting note is that the only other production model vehicle with rear-facing seats is the Mercedes-Benz E-class wagon. So it's nice to see some nostalgia going on at the world's most advanced electric car maker, which is located right here in the USA. Otherwise, the only car with rear-facing 1970s seating would be a German one. That's just not right. Photo courtesy of Craig Agranoff. If Tesla engineers could solve the issue of getting motion sickness while sitting in those sits, then they should win an award. HUD for movies? And camp chairs don't come with seatbelts.